I am not a big fan of kitchen gadgets. I have my Kitchen Aid mixer (which I got as a wedding present- but would definitely get another if mine died), a Magic Bullet blender set (for smoothies and grinding nuts and coffee beans), and an immersion blender that I got at a garage sale (which is super handy for mixing dips and making creamy soups). Zulily (affiliate link) is having a sale right now on "Stay Healthy: Kitchen Essentials". There are several things in this sale that I use pretty frequently in the kitchen that make cooking healthy foods easier and you may want to check out. 1. A digital kitchen scale is super handy for bread making if you need to way your ingredients instead of just measuring. This scale does both metric and standard weights of up to fifteen pounds. I also use my digital scale to way packages. I hate waiting in line at the post office, plus if I pay for my postage online and print my labels, they usually give you a discount. So I almost always weigh my stuff at home, print my own postage, tape it on and just drop my stuff off at the post office and go. 3. I was skeptical about herb keepers, but I was tired of buying fresh herbs and having them turn into black mushy messes inside produce bags. Basically, you put a little water in the bottom of the keeper and then stick your herbs in so the cut ends are in the water. (Like you would for a bouquet of flowers). And it really does work. Herbs stay fresh and usable for weeks. Plus, the size is compact enough you can just stick it in your refrigerator door and easily find it when you need it. 4. I got my veggie steamer from Pampered Chef too. It looks very similar to this one, but once again, I paid more for it. But, I do love it, so I guess it's okay. Basically, all you do is boil an inch or so of water in the bottom of a pot, with your steamer sitting inside, then add veggies, cover, and presto, steamed veggies in under ten minutes. I try to eat fresh veggies more than canned, and this is a great way to cook them quickly. I use my steamer for cauliflower, broccoli, asparagus, kale, cabbage, you name it. You can do pretty much any vegetable, just make sure you don't let all your water steam away on the ones that take longer like carrots. 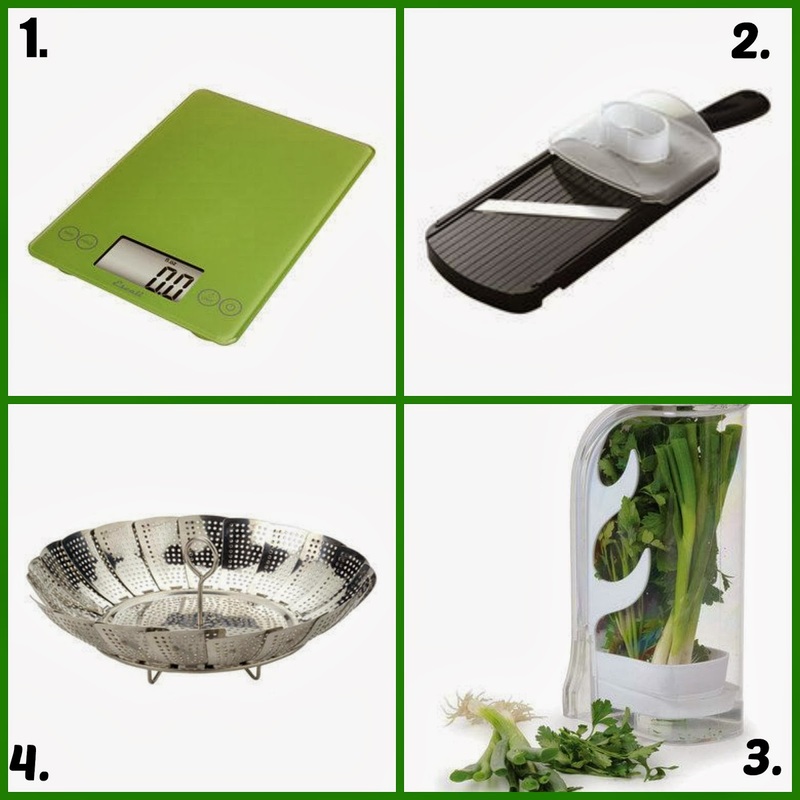 So, if you're trying to cook healthy and use fresher ingredients, these are tools I would recommend. What do you think, is there any kitchen gadget that you use all the time that you think I'm missing out on?